Discuss ceramic’s sustainability story through a review of industry standards and research initiatives, such as how life-cycle analysis (LCA), standardized environmental product declarations (EPDs), and product category rules (PCRs) dictate value choices. Compare competitive materials based on lifespan by the amortization of values over time. 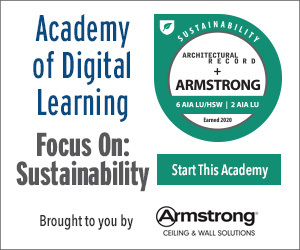 Develop a shortlist of criteria to select sustainable building materials based on common attributes like durability, maintenance requirements, and performance characteristics. Describe the difference between slip resistance and the dynamic coefficient of friction (DCOF), and specify tiles that can be used in universal design and meet ADA barrier-free requirements. At the American Institute of Architects (AIA) 2017 Conference, as a response to the nation’s unprecedented challenges in the areas of “equity, human rights, sustainability, climate awareness, economic opportunity, and architecture that strengthens community,” 4,436 architects reaffirmed their own “Hippocratic Oath” to care for the planet. This recent powerful statement confirms the idealism and commitment to making a difference in the world through design. In the past decades, the AIA has taken numerous steps to celebrate and encourage advancements in sustainable design from the Committee on the Environment (COTE) to the AIA 2030 commitment design data exchange. These initiatives are driven by powerful environmental data both from the United States and abroad, which shows that not only do buildings change their users, but they also can change their communities as well as larger surrounding ecosystems. 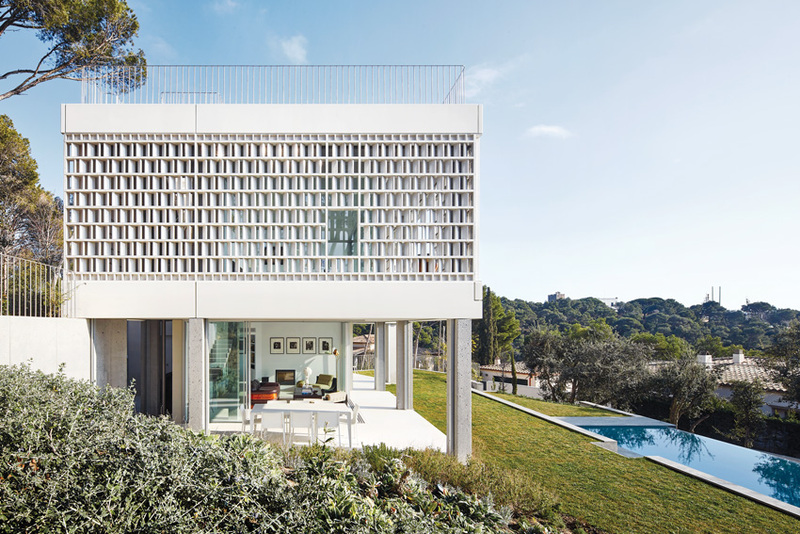 Exterior porcelain panels show the versatility of ceramic as a durable, sustainable material in this Spanish “lattice house” designed by Emiliano López & Mónica Rivara Architects. Architecture 2030, a nonprofit organization, began sounding the alarm about climate change with statistics identifying buildings as one of the main culprits in the waste of electricity, natural resources, and a major contributor of greenhouse gas (GHG) emissions. Not only architects were paying attention to alarming data concerning climate change and the destruction of the planet’s natural resources, but owners, contractors and manufacturers of building products are also engaged. As numerous green building rating systems have proliferated, each year brings us closer to developing products that are green from cradle to grave. Industries are beginning to investigate in a life-cycle analysis (LCA) of their products. LCA requires that a producer assess the environmental impacts associated with all of the stages of a product’s life from the extraction of a raw materials through processing, manufacturing, use, repair, maintenance, and eventually the re-purposing or recycling of the product (cradle to cradle) rather than the landfilling of materials. For decades dismissed as a “fad,” mere “tree hugging,” and a “fashion that would quickly fade,” a new building genre is now driving a permanent environmentally conscious sustainability market. “The Drive Toward Healthier Buildings,” a 2016 report by Dodge Data & Analytics, documents the benefits and metrics for measuring healthier building impacts.2 It reports that 30 percent of all surveyed building owners would like more transparency on product information. According to this survey, in the next five years, 64 percent of the respondents will expect that construction materials and construction techniques will enhance air quality. 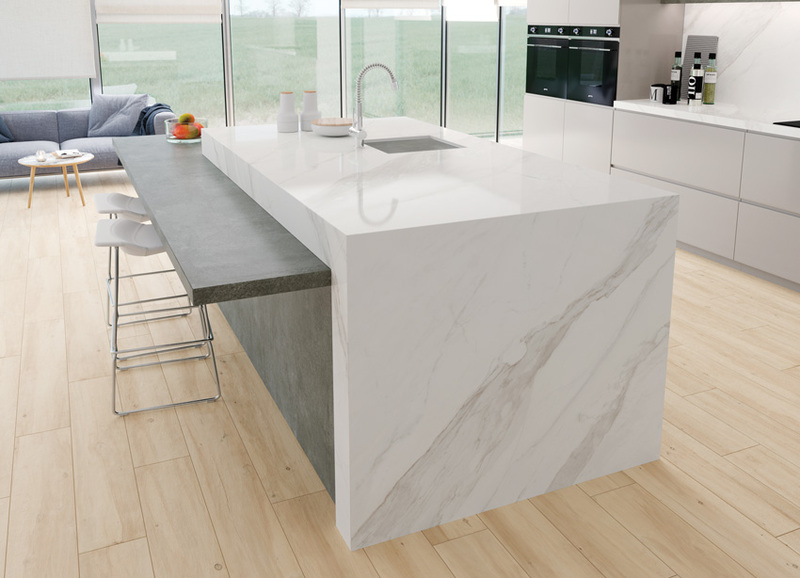 New ceramic markets include these new gauged porcelain slab countertops, which provide an elegant, durable, heat- and stain-resistant alternative to the use of natural stone or laminates. The ceramic tile industry is one vivid example of how an industry is examining and changing its environmental footprint. In addition, these changes are also providing increased manufacturing savings in production and energy. The size of the ceramic construction tile market in the United States is forecast to grow at a rate of almost 10 percent over the next decade.3 Ceramic tile is one of the most widely used flooring materials in the world. is chemically inert and inhibits the growth of mold, mildew, fungus, and other organisms. As this industry has investigated sustainability initiatives, it has also found new markets. New products include advancements in tiles to meet universal design criteria, new solid countertops, half-inch-thick exterior pavers, and large exterior surface cladding. The industry is now using the term “gauged” as a new term for a thin tile or porcelain product and there is a vast array of new gauged porcelain and gauged tile products. The ceramic industry is taking a lead in the midst of a major change and approach to healthy, sustainable building materials.